This page will highlight the procedure we’d like you to follow whenever adding data to the ODP database. By following these simple guidelines, you’ll ensure that your work will be efficient, effective, and useful. Investigator 1 downloads a blank Data Entry Sheet (note that a Google Account is required at present). Investigator 1 downloads a PDF of a paper with measurement data for Specimen 1. Investigator 1 enters the specimen data and measurements for Specimen 1 into the Data Entry Sheet. Multiple specimens may be included here. Investigator 1 e-mails the Data Entry Sheet to the Project Lead (andrew.farke@gmail.com), along with the relevant bibliographic references. The Project Lead saves the full dataset, and posts the basic information (excluding measurements) to the Verification List. Investigator 2 downloads the Verification List. Investigator 2 sees that Specimen 1 needs to be verified. She then downloads the PDF for the relevant paper, and enters the data on the Verification List. Investigator 2 emails the completed Verification List to the Project Lead. The Project Lead compares the data entries by Investigators 1 and 2. If both entries are in agreement, the Project Lead posts the data to the Public Spreadsheet. If there are discrepancies, the Project Lead identifies and corrects them. This system may seem lengthy to some, but we have chosen to implement this in order to reduce the possibility of typographical errors or data vandalism. If you do not have a Google account (required for download of the project spreadsheets), email Andy Farke (andrew.farke@gmail.com), and he will get you the latest version of the relevant files. In order for this project to be a success, it is important that data entry be accurate, consistent, and referenced to the literature and original specimens as appropriate. It is especially important that each set of measurements represent only a single individual – we do not want bonebed material being entered as one specimen, even if the sizes are vaguely consistent. Juvenile individuals, estimated measurements, and missing measurements need to be indicated as such. Indicate a juvenile with a J in the appropriate column. Indicate an estimated or incomplete measurement with an “e” next to the measurement. If you have measurements that you have personally taken from a particular specimen, enter these in the data table in the same format as for literature-based measurements. In the reference column, indicate that it is a personal observation. For example: “Farke, pers. obs.” Only measurements from specimens held within publicly-accessible, permanent institutions should be entered within the database. This is important to ensure reproducibility of the results. Although we appreciate the thought, this is not an appropriate place to include data from specimens you are trying to sell. IMPORTANT: The specimen number must be included for every measurement. Without that, measurements are essentially meaningless, and it becomes impossible to check them. Units: Use millimeters (the standard for most papers) when entering data — convert to mm if the paper uses a different unit. Do not include the unit designation (mm) in each cell. Phalanges and metatarsals/metacarpals: As you will see below, right and left phalanges and metacarpals are entered in one cell, separated by a “/”. Because Excel and other spreadsheet programs may interpret this as a date (and automatically format the data in a way we don’t want), put a space between the measurements. So, if you have data for metatarsal II, and the right one measures 12 mm and the left one 11 mm, enter it as “12 / 11” rather than “12/11”. The latter format might be inadvertently changed to “December 11” or “November 12” (depending on your country’s date convention). Rounding: Enter the data exactly as in the original publication (or to the nearest mm or tenth of a mm as appropriate for original measurements from the specimen). Excel or OpenOffice.org may round the values for display, but the original cell will retain the data with decimal places. About measurements from photos and drawings–Do not include measurements made from photographs or drawings. Although we appreciate the effort to fill in blank cells of the database, it is very difficult to ensure that the scale bars or suggested magnification are correct, and our experience shows that they often are not. Only include numbers seen directly in tables or text (or from direct measurement of specimens). 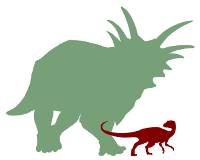 Taxonomy–We realize that the taxonomy in many older papers is outdated – for instance, one of the most complete skeletons of Centrosaurus apertus was described under the name Monoclonius nasicornis. However, for ease of tracking data, we ask that you always include the original name under which the data were published. If you have an opinion on the correct assignment for the specimen, you may enter it in the columns at the end. In recognition of the fact that different workers have different opinions on taxonomic validity (e.g., Lesothosaurus vs. Stormbergia), we want to maintain a good “chain of custody” for the data that will protect the database from capricious edits and maximize transparency for future workers. Bibliography–When submitting data, please include a reference for the relevant paper(s) in PLoS ONE format. See here for more information. Let’s pretend that you’ve found a paper on Edmontosaurus regalis, specimen RAM 4875. It isn’t on the verification list, so you’ll start this as a new entry. The specimen preserves a right humerus, right radius, left ulna (a notation in the table indicates that the measurement is estimated), left metacarpal I, and right metacarpal II. A femur is also preserved, but the authors neglected to mention which side it’s from. Left and right tibiae also occur, but only an average measurement is presented. First, you’ll want to download the blank data entry sheet from Google Documents. When the page opens up, find “File – Download As” on the Google Docs page, and save the file locally on your computer. If you know the side of the element (right or left), you enter this in the appropriate column. We’ve devised a set of hopefully-not-too-cryptic abbreviations to indicate this. Each element will typically have at least three columns under it: “R L” (right length), “L L” (left length) and “L” (length). The last designation is for cases in which an average measurement is presented, or the authors don’t state which side is preserved. So for the example above, you would enter the humerus and radius measurements under the “R L” column for the appropriate element, and the femur and tibiae would be entered under the “L” column for their respective elements. The ulna is a special case – because it’s estimated (often thanks to crushing, etc. ), you would put an “e” after the entry. So, if it has a reported estimated length of 725 mm, you would enter “725e”. For measurements of hand and foot bones, we have decided to only include single columns. In this case, we indicate the measurements with a “/” between the right and left sides. For instance, because the left metacarpal I is preserved, we would enter ” / 145″ (because no right is preserved), and ” 152 / ” for the right MC II (because no left is preserved). If MC III had both left and right measurements, we would enter ” 220 / 218″. And, if MT (metatarsal II) didn’t have the side indicated, we would just write “310”. In our experience, most papers don’t indicate left or right for pedal and manual measurements. Finally, don’t forget to email your file (in Excel [.xls] or OpenOffice.org [.ods]) format to project head Andy Farke (andrew.farke@gmail.com). And – don’t forget to include the bibliographic information! The procedure would be the same if you were entering a specimen on the verification list – you would just use a different spreadsheet. The Data Entry Sheet can be downloaded as a Google Document from here. When you email it to us, .xls or .ods formats are acceptable. The “new” .xlsx format output by recent versions of Microsoft Office is okay, but not our favorite. We can read them, but compatibility quirks make the .xlsx format difficult to process. If you have problems accessing the link, email Andy (andrew.farke@gmail.com) and he’ll get you the files. The Verification List can be downloaded here. File format preferences follow those listed above. If you have problems accessing the link, email Andy (andrew.farke@gmail.com) and he’ll get you the files.